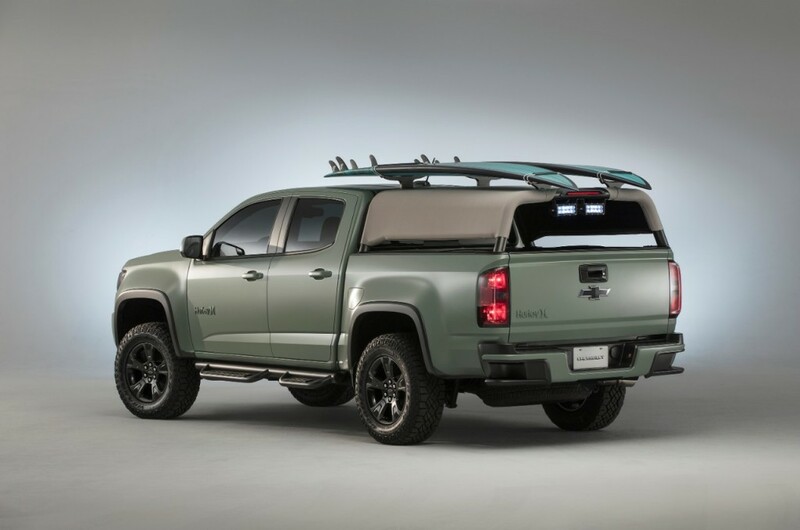 The Colorado Z71 Hurley Concept is a concept pickup truck introduced by Chevrolet at the 2016 Specialty Equipment Manufacturers Equipment Association (SEMA). The show truck is based on the Colorado Z71 Crew Cab and was developed as a result of a collaboration between Chevrolet and surfing brand Hurley “to get surfers and their gear around with functionality and style.” Chevy and Hurely describe the concept as the “ultimate wave wanderer” that “also serves as a mobile beach command center”. Water-resistant seat covers made from advanced ventiprene, a breathable and quick-drying material similar to the neoprene used in surfing wetsuits. The material is perfect for jumping into the vehicle with wet boardshorts. The Khaki Green and Sand Dune-colored material is also on the armrests and door panels. The rest of the cabin is accented in Khaki Green and Sand Dune trim and green accent stitching, while the Hurley logo is integrated in the headrests, sill plates and floor liners.